Pressurized gas is a key component on any draft beer system. This dependable 5 lb. aluminum CO2 air tank provides the right amount of pressure to your gas lines. Made of high-strength aluminum alloy, this CO2 air tank is lighter than steel and will not rust. Measuring 18 inches tall and 5.25 inches wide, the tank has a capacity of 5 lb. of CO2, which will last for roughly 6-8 half kegs. When in use, the tank must be in a fully upright position, so do not tilt or lay it on its side. The body of the canister has a brushed finish and the dome is unpainted. It comes with a CGA 320 valve. The tank is stamped with required U.S. Department of Transportation (DOT) and Transport Canada (TC) Markings. Due to Federal regulations, your aluminum gas tank will be shipped empty. To fill with CO2 before you hook up your draft system, check your local listings under “Gas,” or try local fire extinguisher supply or welding supply companies. If you have a multi-tap system, you can buy your 5 lb. CO2 tanks in bulk for extra savings. There really isn't much to say about it other than it was a very good price and Kegworks did a great job shipping it out quickly. Great service; order it online for my Kegerator build and able to pick up my new tank the next morning. Excited to pour my first homebrew. Every home co2 dispensing system should alway have a full co2 spare cylinder ready for change out. It was exactly what I needed. They wanted to trade my cylinder at the CO2 refill center and I refused as my tank was perfect. This is my second tank. The first came with my BeerMeister 53 years ago. They don't see any hard use so they last a long time. This new tank looks just like the old one, except it looks new. The quality looks to be just as good if not better than the old one. If you are in the market for a tank, one that will last over 50 years than I believe you have found it. Nice piece of equipment to have. the price was right for a new one. would buy from here again. fast delivery also. Just what we need. A great tank. The CO2 tank was delivered on time and the sale price made it really affordable. It looked really great. Well made bottle, great value. This is my first experience with a kegerator setup and this bottle will serve me well for many years to come. I wanted an extra cyl. for doing a quick exchange for the nearest place to fill your cyl is quite a distance away. Someone said my current tank contained lead. Cannot confirm or deny if it is healthy or not. so, better safe than sorry. I need a replacement second tank for my new bar fridg. I needed a back up tank for my kegerator. Back up CO2 tank for kegerator. Have to go 70 miles to fill, so always have a backup bottle available. need an extra one and this looks like the one I have. The only one you had that was small. I like the flat bottom as the one I currently own has a rounded bottom. Important to have a back-up incase you run out of CO2 at 9:00 at night, but still have half a keg to pour through. You dont want to be left stranded without a co 2 tank !!!! Where was this tank manufactured? BEST ANSWER: Hi John! Thank you for your question. We source our CO2 tanks from multiple manufacturers based on availability. Our manufacturers have plants all over the world, so depending on when you place your order you may receive a tank made in USA, China, or another country. When you're ready to place your order, you can call our Customer Care department at 877-636-3673 and they can confirm what we have available at that time. The valve is stamped "Made in USA". I don't see any other markings. How many gallons of beer will a 5LB CO2 tank dispense? BEST ANSWER: Hi Mike, a 5lb CO2 tank will last for about 6-8 Half Kegs. A Half Keg holds 15.5 gallons, so you should be able to dispense 93-124 gallons per tank. Cheers! We have a kegerator from a bar. The air line was run to the outside for a 20lb tank and that is where we put our 5 lb. tank. My friend was told by a beer distributor to put his inside his kererator. Which is right or the best? BEST ANSWER: I think inside is better. The tank, air and line will reach the same temperature as the keg and no additional heat will be introduced inside the kegerator. With the tank outside it will be at the room ambient temperature. Since your line and air will penetrate the liner of the kegerator, an unnecessary heat path will be introduced into the kegerator. This added heat will cause the refrigeration system to run more. Now how much more energy will be used and how much added cost I can't say, it could be pretty small, but given the choice between tank inside or outside I would always choose inside. I have my 5# tank inside my kegerator feeding my two 3 gal kegs. Works great. I also have a 20# tank outside the same kegerator feeding my two 5 gal kegs. Also works great. I'm sure the beer distributor knows a lot more about this stuff than I do but I've had this arrangement for a couple of years with no issues. I actually track air usage and the 5# tank seems to last a long time, although who fills it seems to make a difference. The 20# tank lasts about a year. I don't know if its best or correct, but I always put my tank inside the fridge. On another note, I have to, my keg is in a fridge downstairs in my basement. I rigged up a system and ran the lines up through the basement into my sink where I have a tap next to my water spray handle. I drilled a hole through the front of the fridge, lines run up about 5 feet to sink. I have friends who have done the same, putting tank next to keg in fridge. I bought this CO2 tank about 8 months ago, and I have mine in the kegerator. I drink lots of IPA, so the colder the beer the better. I recommend the CO2 tank to be in the kegerator. 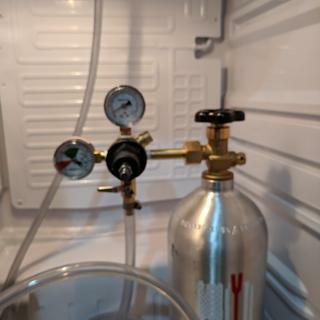 Our CO2 tank can go either inside or outside but be sure to compensate for the temperature difference between your beer and CO2 as pressure is directly proportional to temperature. Shouldn't make any difference. CO2 is stored outside by the welding supply companies and the gas cools during expansion. Probably makes no difference, but good to put inside and have it out of the way. How to identify that the tank is certified? Label or engraved marking? BEST ANSWER: All tanks should have the month and year that it was last hydro tested. It usually consists of a stamp in the metal with 2 numbers, a symbol, followed by 2 numbers. 03@14 for example. March 2014. CO2 tanks for to be tested every 5 years. So March 2019 in this example. Hope this helps. Mike from Lakeland's Beer Revolution. You are not necessarily looking for a marking or engraving to certify. You are concerned about the pressure rating. When you have the tank filled they are required to ensure the tank is pressure tested.. When you first purchase a cylinder there are engravings around the top globe. Serial number, pressure rating and so on. The states the tank has been rated. There should be a date stamped into the bottle somewhere near the top. Ex: 10.12. Would be October of 2012. The first certification is good for 10 years and then needs to be recertified every five years after that. It didn't matter. Since most places exchange, I never saw mine again. The certification is stamped in the tank. Is this a non-dip tube co2 tank? BEST ANSWER: This is a non dip tube tank. If you want liquid turn it upside down. This CO² tank is a non dip tube tank. Can this tank be used for nitrogen? BEST ANSWER: Hey Chris! Thanks for checking out Kegworks! This tank can not be used for nitrogen, or any nitrogen/CO2 blend. Please check out the nitrogen tank listed below, and don't forget the nitrogen regulator, too! Bought this with the Economy Single Gauge CO2 Regulator (ITEM # JO-60K). What size o-ring is needed as one did not come with the tank or regulator? BEST ANSWER: The part you need is a nylon washer. I have attached the item here for your reference. Dose the co2 tank work both styles of co2 regulators (i.e. Rubber o-ring/taprite vs. nylon/plastic washer)? What is the date stamped on to the tank? My co2 dealer says there is a time limit before the tank has to be recertified. BEST ANSWER: Thank you for your question. Our CO2 tanks are sold brand new and they are certified for 5 years from the date stamped. Our current inventory is dated 09/15. That date is subject to change depending on when you order. Cheers! I possibly need 15-20 of these. Do you offer any price breaks on large quantities? We do offer a price break on quantities of 10 or more. They would come out to $58.49 each, which is a 4% savings. How recent are the hydo dates on your current inventory?